LAS VEGAS (AP) — A lawyer for elastic exercise band maker TheraBand blamed former U.S. Sen. Harry Reid on Tuesday for his own serious injuries, including blindness in his right eye, suffered when he says his grip slipped and he fell while using a flexible device on New Year’s Day 2015. 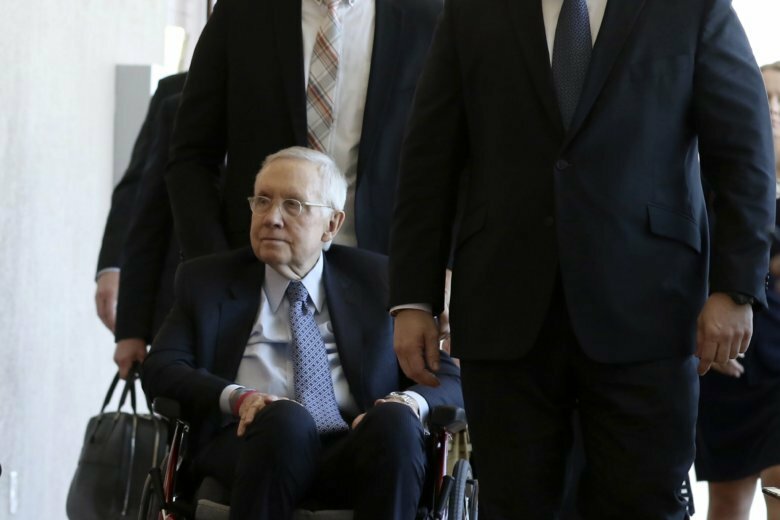 With the former Democratic party leader, now 79, sitting in a wheelchair in a Las Vegas courtroom, company attorney Laurin Quiat told a civil trial jury that congressional exercise advisers tried for months to teach Reid to improve his foot stance, balance and technique while using the resistance bands at his doctors’ recommendation. “This product was designed to provide him with stability, strength and good health as part of a cardio-rehabilitation program,” Reid attorney James Wilkes II said during opening statements in Nevada state court. Attorneys spent a contentious day and a half picking eight jurors and two alternates from a pool of 100 prospective jurors that included some who flatly stated they couldn’t impartially consider any case involving Reid. Wilkes said he felt more discomfort in the courtroom Monday than ever in his long legal career. He hasn’t said when Reid and his wife, Landra, will testify. Testimony is expected to take a little more than a week. “The evidence will show that he was using a band … it slipped from the hand, he spun to the right … and landed right on the eye,” Wilkes said, telling jurors they’ll hear from doctors and see photos of Reid’s bathroom with hard granite and marble counter tops. Quiat countered during his overview of the case that Ohio-based Hygenic Intangible Property Holding Co. and subsidiaries that make TheraBand feel sorry that Reid was injured. But he called it an accident. Reid also was treated for broken bones around his eye, fractured ribs, a concussion and bruises. His lawsuit seeks unspecified monetary damages from the company for negligence and failure to warn the public the elastic physical resistance band was “unreasonably dangerous,” particularly for the elderly like him. Quiat, displaying a gray flat stretch of wide elastic band that he said was marketed for decades, said jurors can never know for sure if Reid was using his company’s product at all, because Reid family members threw out the one he used the day he was hurt. No one will contend that Reid intentionally let go of the exercise band that had been looped through a shower door, the company attorney said. But jurors might surmise that Reid lost his balance because he was dangerously leaning away instead of using the wide and balanced stance he’d been advised to use with the bands. Wilkes said Reid will testify that “he remembers pulling the thing and the next thing he knows his eye is broken, his ribs are broken, there’s blood everywhere.” Secret Service agents drove Reid to a hospital, the attorney said. “Sen. Reid was improperly using a flat resistance band that morning and he’s responsible for his own injuries,” the company attorney said.